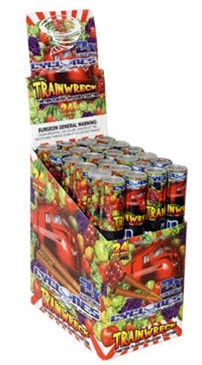 Trainwreck flavored Cyclone blunt wrap cones are a combination of 13 flavors smashed together. There are 2 pre-rolled cones per tube and 24 tubes per display. Brace yourself you are about to be blown away! Cyclones™ are the world's first pre-rolled flavored blunt. The cone style of rolling blunt cigars has become very popular due to it’s unique burning characteristics. However rolling such a shape is a difficult and messy process for most. Cyclones™ instantly remedy this problem as they are already pre-rolled! The pre-rolled “Cyclone”™ funnel shape allows the user to easily place their tobacco within the wrap with no spillage. A built in paper filter tip adds to the convenience of Cyclones!™ Cyclones™ come in nine whirling flavors; Peach, Sour Apple, Fruit Punch, Strawberry-Kiwi, Blueberry, Honey, Natural, Mango and White Chocolate. Average Customer Review: 4 of 5 Total Reviews: 4 Write a review to tell others what you think about this item. Paper was dry and many stick together which wind up ripping more than half of the order. Usually never had issues with cyclones.